I call my 955i Tiger 'Ossi', as the sticker on the side panel looks like it's reading 'Ossi', '9' with big head looks little bit of 'O'. Ossi is male name in finnish. It sounds little funny to call it that way. Mine actually sounds like a steam engine when pulling away from a stop. 1992 BMW K100RS 4V 49K Broken but not dead. She shall arise from the ashes! 1998 Triumph Tiger. This bike rocks! I remember when the '99 models came out. They were sometimes referred to as "Electrics", as in diesel/electric locomotives compared to steam locomotives. Maybe the fact that they also had electronic fuel injection had something to do with it. We seem to have settled on Girly, but I wanted to inject that little memory in there, before it goes away. Sorry, new to the Triumph fold and I see the term a lot, (which i'm assuming is a model) but what the hell is a "Steamer"? My kids will tell me it's a fresh pile of dung? 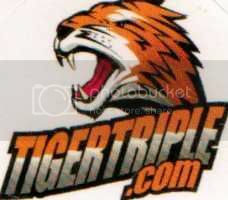 Its the nickname on the first gen Hinckley Tigers, that went from 1993 to 1998. There is a tread around on the forum explaining the nicknames in the various models. 2011 white Tiger 800 roadie, with a naff tiger decal on the tank so you know it\'s me! That forum hasn't yet christened the Explorer, and over on the Tiger Explorer forum, http://www.tiger-explorer.com/index.php?action=forum#c1 so far I've seen TE, T12, X12, E12, Tiger 1200, Tiger Ex, Tiger Explorer, and simply Explorer along with some personal sobriquets like Dora. Make time to ride, don\'t ride to make up time. I'll be interested to see what moniker they give the spooked wheel version :? Seems to me to be a fine name for an individual bike, but I'm not sure it fits as a more-generic term for a class of bikes. Not that I have any better ideas myself, but I'd be surprised if that goes into general usage. They might just steal your tag, which wouldn't be half bad actually.